My dehydrator cranks out plenty of people treats. Now let’s dry some homemade dog treats. 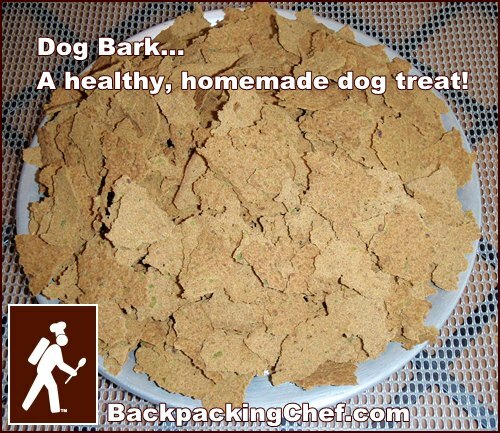 By the way, if you are a Paleo Man, you will enjoy my dog bark recipe almost as much as your dog. At the bottom of the page, please share your homemade dog treats recipes if you have some. One way to ensure that your dog will enjoy his treats is to include plenty of meat. I use cooked ground beef in the “Dog Bark” recipe below. By drying your own homemade dog treats, you can avoid the grain fillers, like corn, so inappropriately common in dog food, and combine the meat with healthier dog friendly ingredients including sweet potatoes, green beans, carrots, broccoli, spinach, apples and pumpkin. Peel and cut sweet potato into chunks and begin boiling in two cups of water. Trim green beans and cut into smaller pieces. Add to pot with sweet potato when potato chunks are half way to soft. Continue cooking until sweet potato chunks are soft enough to mash. Pour off, but retain, the cooking water. Cook ground beef in a fry pan over medium heat until brown. Tip: If you start off cooking the beef on low with a lid from another pot over the meat, then liquid and fat will lubricate the pan and you will not scorch the meat. Once you have liquid surrounding the beef, turn up the temperature to finish cooking. When the meat is browned and cooked through, drain off liquid and pat meat dry with paper towels. Add cooked ground beef to pot with sweet potato and green beans. Add 1½ cups of the retained cooking water and mash with a potato masher. Divide mush into two or three parts and run through a blender until smooth. Spread thinly on dehydrator trays covered with non-stick sheets and dry at 145° F for approximately six hours. After four or five hours, flip dog bark over and dry without the non-stick sheets. Dog Bark is not brittle when dry, so it does not present a choking hazard for dogs. It should feel completely dry and will break into pieces easily. Yield: This homemade dog treat recipe yielded four cups weighing seven ounces. A good serving size that a dog will scarf up in seconds is ½ cup. 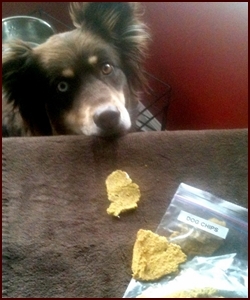 For variety, try using any other dog friendly vegetables in this homemade dog treat recipe. Dried ground turkey or chicken could also be substituted for the ground beef. I gave a serving to Billy Bob, my neighbor’s dog, and he loved it. Let’s say you and your best friend are ready for some lunch. 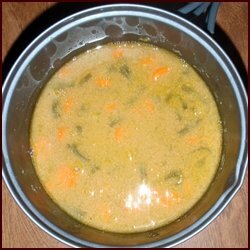 This backpacking soup recipe is a real treat for your dog and you, especially if you follow the Paleo Diet. I added a little salt and pepper to my serving and it was delicious. Place all ingredients in one Ziploc bag. Put ingredients in pot with two cups of water and soak for five minutes. Light stove and bring to boil for one minute. Turn off stove and let sit with lid on for ten to fifteen minutes. Stir to dissolve bark completely into thin gravy consistency. If it's just for your dog, you could pour boiling water over the food in his bowl and let it sit about 20 minutes. I brought a one-cup serving over to Billy Bob and he greeted me with tail wagging. My neighbor said not to expect much since Billy Bob was not fond of vegetables and usually ate around them if they were ever on his plate. Not so this time. Billy Bob cleaned his plate! 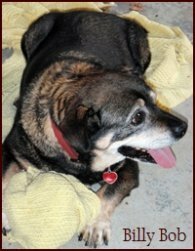 Billy Bob is too short-legged for trail running, being a Hot dog – Rottweiler mix, and he’s too old to chase the UPS truck these days, but he still wrestles with the occasional raccoon, so he deserves a homemade dog treat for that. Do you have a dog treat recipe you would like to share? Use the form at the bottom of the page and I will post it here. Thank you! Cook chicken and veggies in large pot with enough water to cover ingredients. After cooked, let cool. Puree in processor with some of the water in pot. I have found the chips are stronger when not watered down too much and I use breast or thigh meat and not ground. Dehydrate and break in to chips. Dog loves them! Chips can go camping as snack or rehydrate back into a gravy for hard dog food. Set tablets aside in one cup of warm water. You can break up or put them through blender to hasten their dissolving. Sauté liver in two tablespoons of bacon grease or other fat until cooked through. Set aside. Chop up and cook veggies, I use the microwave to steam. I make cookies, two tbsp scoops, lightly flatten with hand, bake on parchment about 12 minutes at 350 degrees until set and lightly browned. Dehydrate in Excalibur or store in freezer. Seems like a lot of work on reflection, but then my dog is spoiled and the supplements the vet sells are way more expensive, and my dog wouldn’t eat them. These are good for older dogs joints. I eat them too! 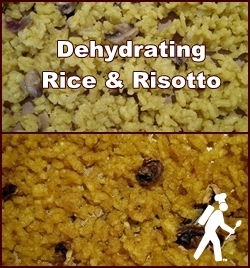 Cooking and adding flavors to rice before drying it lets you make much more interesting meals than if you just use instant rice. How to dehydrate meat, vegetables, fruit, fruit leather, tomato sauce, bark, soup, vacuum sealing and much more. If you have photos of you and/or your dog and/or the treat, click yes and I will contact you with my email address to send them. I understand that you will use my email address to contact me, if necessary, to clarify the information submitted, and that my email address will not be published or shared.